Put the goat's cheese and thyme in a bowl. Season and mix together. Divide into eight and shape each portion into a patty. Put in a dish, pour over the olive oil, and chill for several hours. Preheat the oven to 200°C, gas mark 6. Spread the breadcrumbs on a baking tray and toast in the oven for about 8 minutes, shaking once, or until they are dry and crisp. Transfer the toasted breadcrumbs to a shallow dish. Leave the oven on. Prepare the salad dressing: put the garlic, vinegar and olive oil in a screwtop jar, season, then shake to combine. Set aside. Remove the cheese from the fridge. Roll each patty in the flour, then dip in the egg, then roll in the breadcrumbs until well covered. Place on a baking sheet and bake for 10 minutes (they can go in the oven with the veg for the main course). Combine the tomatoes and olives. Re-shake the dressing, drizzle over them and toss together. Spoon on to four plates, add two pieces of baked goat's cheese to each and serve. 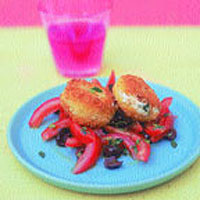 Goat's cheese and tomato work well with Sauvignon Blanc.